Sheffield bought three early Leyland Olympics in 1951 and followed up two years later by the acquisition of this former Demonstrator. It put in a good service life lasting until 1968 when it was sold to Dodd, (Dealer) in Dromera, Ireland. I wonder if it found a buyer or whether it was scrapped? The bus was originally fleet number 211 being renumbered as shown in the 1967 scheme. This photo was taken on 10th June 1967 at the Hillsborough terminus of the 31 Lower Walkley service which was characterised by narrow streets and steep hills. I think I remember these in Sheffield: were they the "integral" versions? Some had an Olympic torch badge on the front, I think. They always seemed high-floored (the opposite to what you could expect) and a bit awkward, but presumably suited the route. From 1952 until 1956 I lived on the 31 and travelled on these and the back loader Royal Tigers. This is now a terminus for Stagecoach 52 and is also close to where the Malin Bridge branch leaves the main Supertram line to Middlewood. Can anyone tell me what size engine were in these Olympics please. I believe the King Alfred Olympic that is currently being restored and nearing completion was rescued from Ireland. I always thought it was a great shame that one of the Halifax Corporation Worldmasters were not saved for preservation especially fleet No1 – KCP 1 what a great registration number! Two of these vehicles ended up in Ireland with Keneallys coaches. The Olympic was the integral predecessor of the Royal Tiger and shared all the same mechanical units – including the 9.8 litre 0.600. They were high floored and probably awkward – but what else would you expect of an early underfloor vehicle? [The open backed Royal Tigers 222/223 were even more awkward.] As for suiting the route, they only suited it for the operator (dimensions and power for a hilly route) certainly not passenger friendly – especially the aged and infirm. Passenger comfort only became a priority from about ten years later when technology and new designs allowed it. Yes- they looked like the ugly sisters in the sixties- especially as you say, the Tiger rear loaders. My point is that I assume in an integral bus you are not fixing a body to a one-size-fits-all chassis and could therefore make some allowance for the passengers… or what’s the point (I think that was the problem- there wasn’t one…?… or was weight reduced?) What were the advantages? You were presumably stuck with the basics of the original body for good? Modern integral buses are monocoque, just like cars (which also used to have separate bodies/chassis)and, I think, are almost universal nowadays. You’re right, though, Joe, you picks your body length, they bold on all the mechanicals and you’re stuck with it. London Transport’s tram/trolleybus department, separate from its bus department, created integral trolleybuses around 1937, using several companies to build them, including Brush and Leyland. Strange how long it took for this system to begin to become popular, around the time when Olympics were coming off the lines and said trolleybuses were starting to go to the scrapyard! 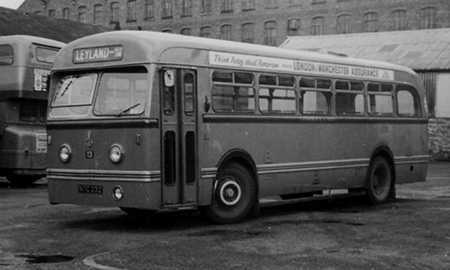 Leeds single deck requirements were few in post war years indeed they only bought 10 saloons in the fifties but managed to have three chassis types! These were 5 AEC Reliances 3 Leyland Tiger Cub and a pair of Guy Arab LUFs. All had the same body layout which was B34C + 14 crush load standees in a central vestibule opposite the doors. Like Sheffield’s Royal Tigers the steps were vertiginous and deep most off putting for intending passengers. Getting a push chair aboard was a major logistical exercise! The overall body shape was common to all ten but the final pair of Reliances had a more upright profile. They were mainly confined to two routes one of which passed under a low bridge and another which crossed the canal on abridge with weight restrictions. Just wait until someone discovers the advantages of "demountable" bus bodies: bodies can be changed or swapped on a "chassis", giving greater flexibility, more opportunities for upgrading, and cutting service times. Why didn’t anyone think of that before? 1904 is beyond most people’s memories, Joe. There were demountable bodies in the early twenties, Joe, although they were usually in the form of exchangeable lorry/charabanc bodies. It never carried over, though into exchangeable bus bodies, to my knowledge, at least, not in a big way. Nice one, Joe. However, the idea of demountable bodies does actually go back a long way. Maidstone and District started in 1911 with three Gilford chassis; these had bus bodies during the day which were changed for lorry bodies at night. I believe the lorries were used to carry vegetables to and from Covent Garden. I’m sure there are plenty of other examples elsewhere, too. No doubt David is right when he talks about weight saving being a factor in the development of integrals, but I rather suspect that other motives in early post-war attempts were to use parts from pre-war chassis, and to generate extra work for the maker. Beadle, of course, were prominent in this field; others included Harrington and Saunders-Roe. I remember this bus from my student days and wondered why there was an odd one with a Surrey registration. It would have demonstrated for Weymann, who were based at Addlestone. Evidently it was never fitted with standard Sheffield blinds. I never rode on the 31 although I had "digs" near Crookes on the 52 route. The open-platform Royal Tigers used on the same route looked odd and a bit reminiscent of Edinburgh; I think the local Inspectorate had something to say about the arrangement. Yes, Geoff, there were responsible for the fitting of the odd looking emergency door at the rear – NEXT to an open rear platform! Roy, what said is true but Weymann and Park Royal never did a Beadle with second-hand parts. I type this about my home town of Sheffield from two miles up the hill from Addlestone. Funny old world. And I, a Surrey-ite, who long ago moved away, still visit my brother in Ottershaw, just across the M25 from you, David. Incidentally, whatever happened to Weymann’s works? I assume it no longer exists. Well, for the initiated Chris, I’m typing IN Ottershaw itself! [Funny AND small world.] Until I retired a year or two back, I passed it on the way to school – St George’s College – but ever since the turn of the millennium it has been a deserted, speculative, office block awaiting tenants. All glass and security guards with nothing to do! You must know that Addlestone Garage is a gated development (yes, in Addlestone) and the Co-op long ago made way for Tescos. A remarkable coincidence, indeed, David! Pardon my irony when I say that the changes you mention pass, nowadays, as progress. The supreme one, though, is the gated development! My abiding memory of Ottershaw is the Aldershot & District Dennis Lances passing by to and from Woking and the occasional ride on them as part of my journey from Portsmouth by rail. Lovely buses. The whole area was a hotchpotch between London Transport and A&D and you could never be sure what company’s bus would pop out from some side turning. Also, Ottershaw was the last/first telephone exchange in the London Area and I would use a callbox there to make calls to my London relatives at local call rates. Some would say miserly, I call it ‘being careful’! Happy days. You could have been a Yorkshireman!!! One of the benefits of the open platforms was that passengers could "hop off" whilst the vehicle was approaching the stop, preventing the driver having to do steep hill starts. The conductor would be ready with his finger on the bell to let the driver know he did not have to stop. No H&S in those days, conductors encouraged it. I got very good at jumping off buses coming up Haymarket to turn right up high street on my way home from school. I believe that is why London kept the Routemasters so long, people could hop on & off where they liked, speeding journey times. Is that Haymarket, Sheffield, Andy? While the subject of bell-ringing comes up (not campanology, silly!) I recall, post-war, the LT conductors giving three rings to signify to the driver that the bus was full up and he could ignore queues at future stops until some passengers got off. Standing was unlimited post-war, I seem to recall, or the limit was ignored, then became eight, and eventually five. Admittedly, buses engines/brakes are more powerful (the latter more vicious, too!) but it was amazing how much more fluid passenger movement was then. They moved around the vehicle, up and down stairs and got on/off the platform effortlessly ‘whilst the bus was in motion’, moved around the vehicle. Despite my advanced years, I’m still fit, yet wouldn’t do those things now, apart from moving to the exit before the bus stops and that with great care and a tight grip on stanchions! I used to love travelling on worn-out LT/ST’s, overloaded beyond belief. Juddering clutches, slow acceleration in waves, the vehicle leaning alarmingly round any corner. Despite all that so-called gentleness, an aunt of mine failed to stop me, as a baby, from falling out of her arms when she was climbing the open staircase of an LT and being caught by a surprised man, unharmed, so they say! Some of you might regret this, boring you with such tales! Regarding the bells, I was a conductor in Sheffield, with a good driver you became a good team and could trust each other, so not just quick bells for passengers getting off but when the last passenger had one foot on the platform and one hand on the pole it was ding ding, if in doubt assist them on with their spare arm. Yes for us three bells was full up and a shower of bells was emergency stop. We didn’t like the passengers using the bell because it sometimes confused things, we preferred the request of next stop please verbally. I took this photo as I have previously said on a trip to the Fishwick depot at Leyland in Lancashire considering there location it is hardly surprising what vehicles they favoured. There livery was and probable still is a Moss Green and Dark Green which was different but quite nice. Practically all there service routes are local and either start, finish or go through Leyland I think the longer distance routes in the area will be handled by Stagecoach Ribble. I have read somewhere that the Leyland Olympic and the Royal Tiger more or less began the end of the vertical front engine single decker bus, as the AEC Reliance came along three years later then the article could have a point. The Olympic was built in conjunction with the body builder Metro Cammell Weymann and I think most of them went overseas rather than the home market. I actually e-mailed J Fishwick & Sons for any information of the above bus, as the company is one of a very few original operators still in existence, and they would have information going back to year dot. They did not even acknowledge receipt of my mail never mind supply information, shame really. The days must have gone when you could write and ask an operator for a fleet list and by return of post it arrived along with a sample set of bus tickets an the odd photo of there latest arrival. The credit crunch must be squeezing quite tight up in Leyland. Hi, came across this picture searching around for Fishwick bus photo’s, I am from the Leyland area and although I can’t shed any light on this bus, I do have a picture of an almost identical Fishwicks bus taken last week at a bus rally in Leyland. As for the company, I am quite surprised you received no response from your email, Fishwicks seem to be quite keen on the history and tradition and always send a number of buses to local rallies and have a downloadable fleet list on their website. Anyway thanks for the picture. When I was a lad of 16 years, I was an apprentice to the Jamaica Omnibus Company in Kingston Jamaica. This was in 1968 and the outgoing busses on the fleet at the time were the Leyland Olympic A, B, and C the "C" being the long chassis version. They were replaced with the "G" Busses. These were clutchless with pneumatic shift levers. This photo certainly brings back memories. I have tried to email J Fishwick & Sons with regard to the single decker Leyland Olympian twice. I have been ignored by the company on both occasions. Apart from being amazingly ignorant or perhaps not very good at email can anybody tell me anything about them and especially the single decker Leyland Olympian 521 CTF. Do they still have the bus, is it still running? What do you know? Edward, this is a video of the actual Leyland Olympian 521 CTF. I went to school on Fishwick’s buses 1959-1961, usually coming home on the 4.30PM Preston Fox Street to "Seven Stars via Croston Rosd" (actually service 115 but Fishwicks had no number displays in them days. It was regularly no.13, NTC 232 on the 4.30, usually full especially on market days, with a standing load, and people left behind. Passengers for Croston Road were rightly annoyed when Penwortham passengers were on, as they had the frequent "Earnshaw Bridge" bus (111). All other Croston Road buses were double deckers, but never this one. Fishwicks had 8 Olympics, and 6 Olympians at this time, mostly for the Chorley routes under Pack Saddle Bridge, and the Bamber Bridge route along Shady Lane. Apologies for digressing slightly but where did Bamber Bridge Motor Services fit into this picture? Was their route from Preston to Bamber Bridge exactly same as Fishwicks and if so was there a co-ordinated timetable? Did BBMS operate one route only? Fishwick’s Bamber Bridge route was today’s service 117, but ran every 90 minutes then, all day incl evenings and Sundays, but went via Shady Lane before Clayton Brook village was expanded by Central Lancs New Town. As today it ran via Brownedge Road, so did not compete with BBMS. This service always displayed simply "Bamber Bridge" whichever way it was going, despite its destination being Preston or Leyland (Earnshaw Bridge). BBMS just ran one service direct Preston (Starch House Square)-Bamber Bridge (Hob Inn), plus works services to Leyland and Lostock Hall, In its latter years one service deviated via Duddle Lane (service D), while the direct route became service P (via Pear Tree). Olympian 521 CTF is preserved and appears at rallies, not sure who owns it. Spent most of its life working 109 and 119 routes, but also worked regularly the Sunday morning Croston Road service, (115), 10.12 and 11.12 from Moss Side (Black Bull) to Preston (Fox Street), 10.43 and 11.43 return (Seven Stars via Croston Road), which service actually went beyond Seven Stars up Slater Lane terminating at the Black Bull, then back along Dunkirk Lane to Preston. There was no 12.12 service on a Sunday, but the 1.12PM service resumed with the regular Croston Road bus no.23, LTD 445, a PD2/1, and worked this run every hour until 11.0pm. The last Olympic to survive was no 17, NTC 234, which was 21 years old when withdrawn, its regular job in its last days was the Vernons Mill to Earnshaw Bridge service, which needed a single decker to get through Factory Lane tunnel under the railway. In earlier days two Olympics together worked this job, such was demand, one just to Lostock Hall,the other working through to Earnshaw Bridge, as shown in the 111 timetable of the day. 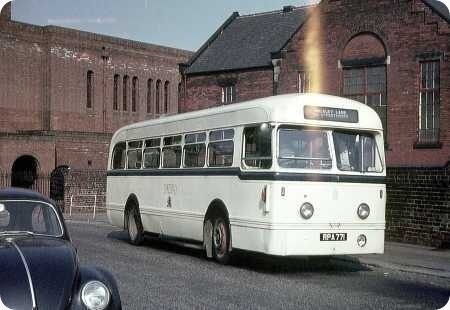 521 CTF Leyland Olympian Single Decker was sold by Fishwick to a man called M.Hayes, Mark Hayes I believe. He apparently has a private bus collection and does exhibit the bus. Does anybody know anything about him? Yorkshire Woollen had a number of these buses. My wife was a clippie at Frost Hill at Liversedge and remembers these buses being on service 36 between Leeds and Elland. On one occasion a driver drove through very deep flood water quite fast and the water came up through the inspection floor boards. I Found the 521 CTF Bus. It is in the British Commercial Vehicle Museum. I shall visit it this Spring. Thank You All. It has been reported in the local media that the company went into administration Tuesday and the last service on the 111 route will be today. A sad ending to a company that had high standards and delighted many of us over the years with the one off and unusual Buses that they operated. The end of an era and a sad day for the Town of Leyland. Very sad news about Fishwick & Sons. Another old-established and well-respected operator ceases to trade. Is there any indication about what happens to their services, most of which were run in conjunction with Ribble? Philip – how interesting to read that your good lady was on the 36 route – in the early 1950s I used to travel on the nearly new Olympics from Leeds to the top of Wide Lane at Morley to visit a friend. That they were of "semi integral" or "chassisless" construction was obvious from the moment the driver pressed the starter as everything from floors to luggage racks and windows began to rattle and thud and the journeys were very uncomfortable – a great shame because they were handsome and lively vehicles, but there we are. Cyril – what an awful piece of news you’ve had to break to us. Being a traditionalist myself, but fully accepting changes in the Industry, I have always held Fishwick’s in the very highest esteem. Their colours, criticised by many as "dour", "drab" etc, are a tribute to unashamed dignity and smartness and the demise of the Company is a very sad loss indeed. Presumably and hopefully any staff so wishing will be accommodated by other operators in the area, while those sadly wanting to call it a day will be able to do so voluntarily. I understand from the "Lancashire Evening Post" that Stagecoach are taking over the 111 service, but that the others will be subject to the tendering process. Just picking up on a couple of points above. Bernard P – it may have been that Fishwick’s were not authorised to carry through passengers on the 117 service. Such restrictions were rife in the decades following Road Service Licensing (1930) and only began to be seriously eliminated with the so-called County Council ‘agency agreements’ of the late 1970s. Or Fishwicks may have found that it caused less confusion to passengers to do things the way they did. Are you sure there didn’t come a point on the route where the destination was changed to ‘Earnshaw Bridge’ or ‘Preston’? Pete D – I think you’ll find that in recent decades the only route which was operated by both Fishwicks and Ribble (to a co-ordinated timetable) was the 109. The fact that most of the other routes were numbered in the Ribble series was a leftover from pre-deregulation days when services were technically ‘joint’ with Ribble (i.e. operated under a joint licence) even though Ribble may have never actually operated on particular routes. This is how Pennine’s Skipton to Malham service was service 211, in pre-deregulation days the services was ‘joint’ with Ribble, even though I don’t think Ribble ever provided any vehicles. Funny thing is, I don’t think Pennine vehicles carried route numbers until well after deregulation anyway! There were lots and lots of services where Ribble had a stake, but didn’t provide any vehicles, e.g. the 39 from ‘Manchester’ (actually Salford) to Liverpool, which was mainly (perhaps entirely) operated by LUT. The converse applied too, the 130 (Bolton-Morecambe) was joint Ribble/Bolton Corporation, but Bolton didn’t operate, instead they did the 122 (Bolton-Southport). Further to the above, further reflection seems to say that the Malham service was 210, rather than 211. A real shame to hear that Fishwick has gone under. There will be no question of Stagecoach maintaining the brand name, unlike the situation in Nottingham where the South Notts and Pathfinder brands continue in use as a positive marketing feature. 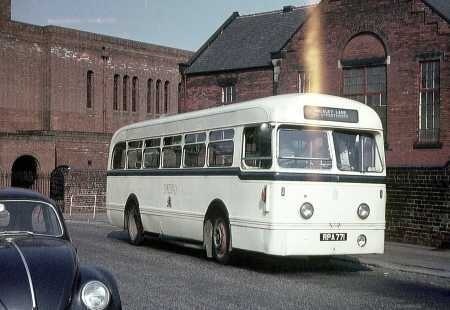 Birmingham City Transport also ran 5 Leyland Olympics. 4 where based at Selly Oak Depot, and one JOJ 261 was used on the Hall of Memory/Birmingham Airport service. This one was based near the city centre. They were Leylands first under floor engined chassisless single deckers. I believe only 23 were built. They where very high floored not easy to board for the elderly or disabled. They where known to as Geeps by the staff at Selly Oak. I loved them, they were very lively and my first speeding caution was in one of them.